Google Home smart speaker revealed as IMAX comes to virtual reality | What Hi-Fi? Google launched a host of new products at its I/O developer conference, including a voice-controlled wireless speaker, Google Home, and a virtual reality platform for Android phones complete with virtual IMAX theatre. Google Home uses the company's Google Cast wireless multi-room technology, allowing it to connect to other Google Cast speakers and Chromecast products. LG, Philips and Sony are some of the brands already making Google Cast speakers, with the likes of B&O and Harman-Kardon also signed up. The speaker makes use of the updated Google Assistant, which promises a “conversational” approach to your requests - from playing music on your speaker, to potentially adjusting your lights - much like the Alexa voice search found on Amazon’s Echo speaker. The speaker itself is a small cyclindrical design, which looks likely to major on smart functionality rather than audio quality, though we'll happily reserve judgement until we hear it. 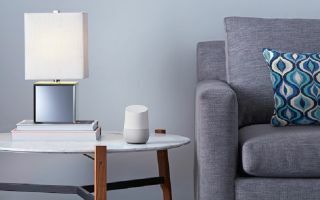 Due out later this year, Google Home, together with the voice assistant and the increasing number of Google Cast speakers, means Google has an increasingly thorough wireless multi-room speaker offering. Also revealed at Google I/O was Daydream, the company's virtual-reality platform for Android phones and tablets. As well as a new headset, a step-up from Google Cardboard, Daydream promises to bring Google Play Movies, YouTube and even IMAX films to a “virtual reality theatre” using your portable device. We also got our first look at Android N, the next Android mobile OS, which is due out later this year, as well as two new messaging apps: Allo, for messages with the Google assistant integrated, and Duo, a new video calling app. Expect to hear more about Google Home and the Daydream VR platform later this year.